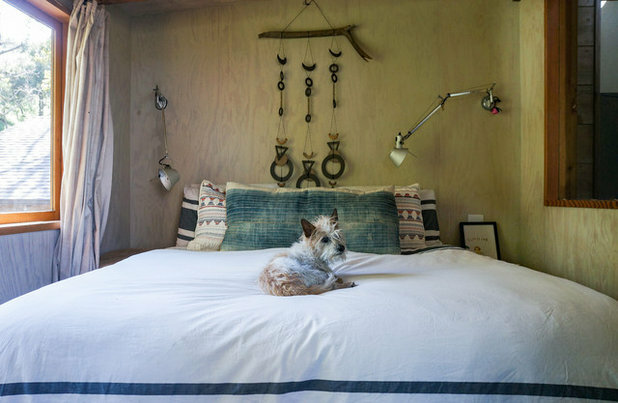 Marni is a Houzz contributor, design and lifestyle photographer, and Founder and Principal of STRUKTR Studios, a content + communications studio. 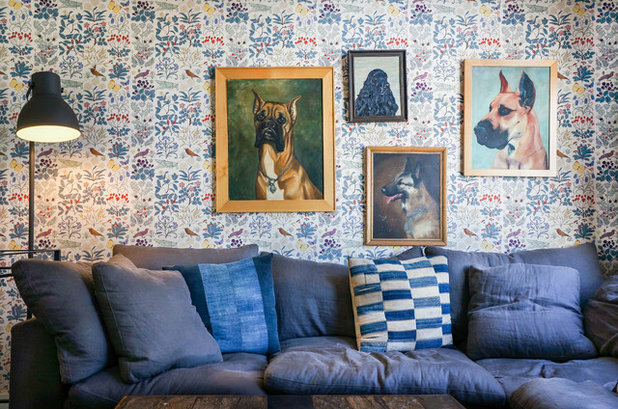 STRUKTR provides photography, video, content marketing, and more, to lifestyle and design brands, like hotels, interior designers, apparel companies. STRUKTR elevates your brand with original content that will increase your visibility, tell your unique story, and engage your clients. 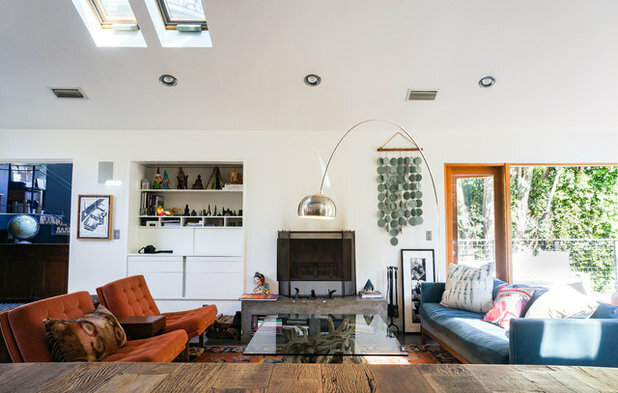 The vibe of Tori Horowitz and Jonas von Studnitz’s home in Los Angeles is both laid-back and sophisticated, where everything is placed in a kind of accidentally-on-purpose way. 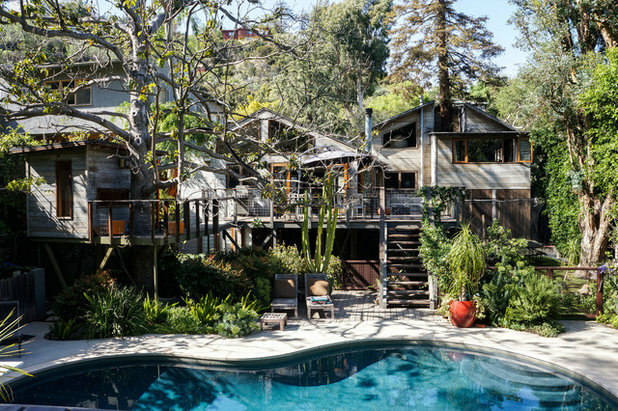 The house, resembling a treehouse tucked up in the winding roads of Laurel Canyon, became theirs in an accidentally-on-purpose kind of way as well. Years ago, Horowitz attended a party there. “I came with friends and did not know the owners. 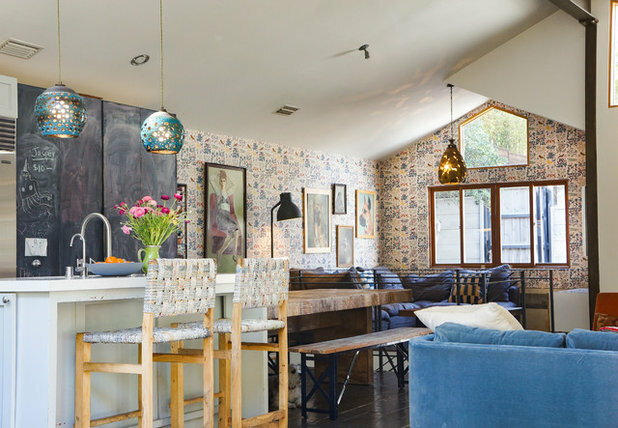 I have a specific memory of standing at the kitchen island, eating cheese and crackers, thinking how much I loved the wide-open great room,” she says. Three years after that party, the home was still kicking around in the back of Horowitz’s mind, even though she and then-fiancé von Studnitz were set to purchase a fixer-upper next to a house they were renting. 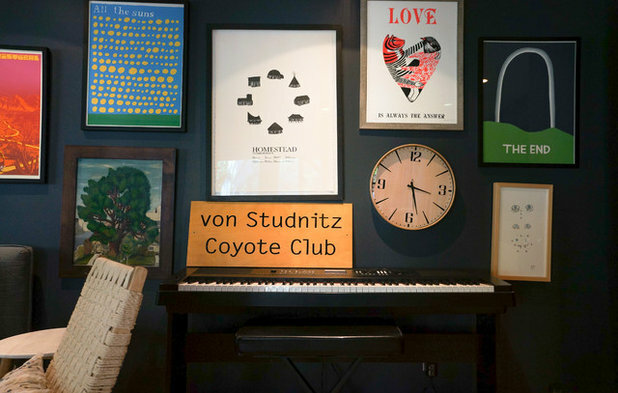 Von Studnitz had just finished architecture school, and the couple had plans for a grand remodel. That all changed when one day while driving, Horowitz saw a sign for an open house and followed it. She couldn’t believe it when the signs led her straight to the home she had been daydreaming about. “I tell my clients that their house will find them. This was definitely the case here,” she says. 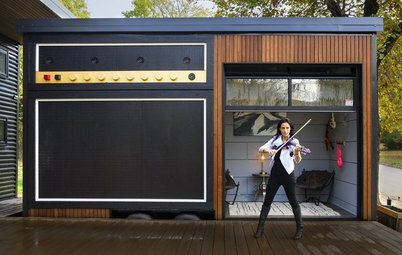 Horowitz, a real estate agent and founder of Canyonhaus, and von Studnitz, an architect, have created a house that is a gathering place for neighborhood kids, a venue for impromptu backyard music sessions and a backdrop for the work of artists such as Jonathan Borofsky and Ray Pettibon. 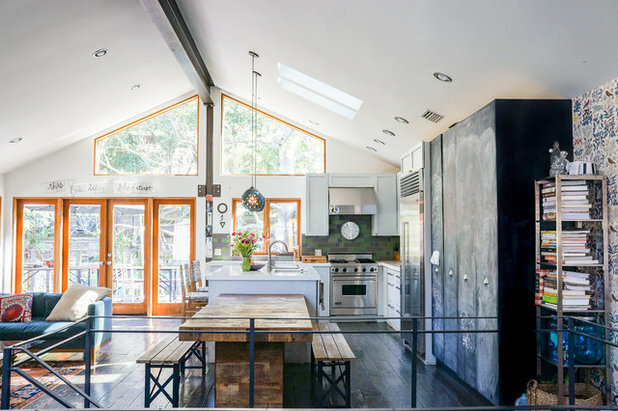 The large open living space connects to nature through its numerous skylights and windows and the two sets of large French doors, which open onto a sprawling deck. The rug is a family keepsake. It belonged to Horowitz’s mother and was unearthed from the family’s garage after a number of years. “We discovered it by accident. 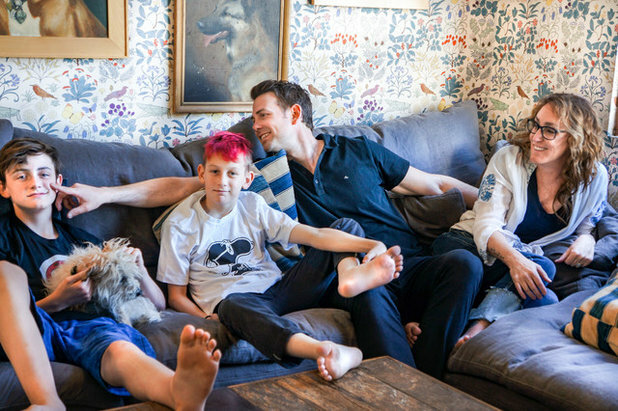 It just happened to tie the colors of the couch and chairs together,” she says. 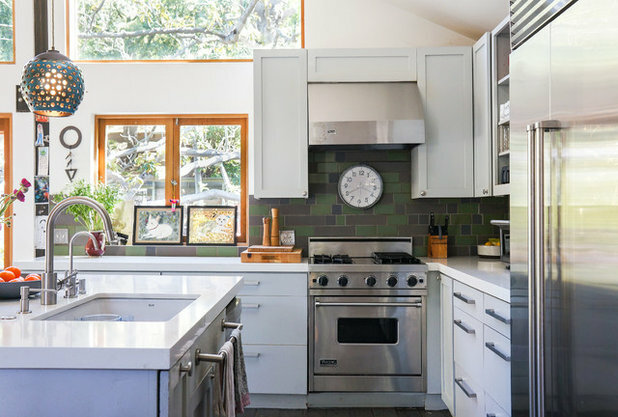 The couple made a trip to Heath Ceramics in Sausalito, California, to buy secondhand scrap tile for the kitchen’s green backsplash. 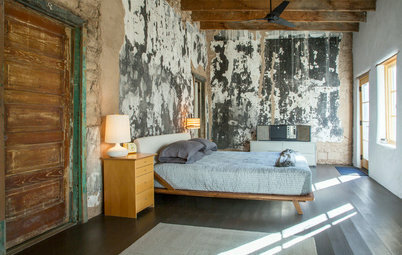 The floors are made of wood that was recycled from a barn in Pennsylvania. The couple love their great texture. 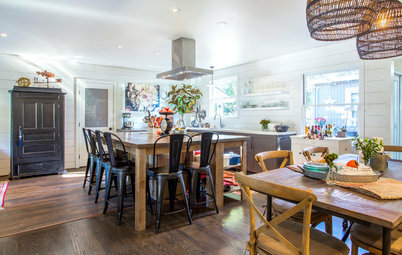 “We stained them gray to offset the woodsy vibe of everything else in the house. They ground the space,” Horowitz says. 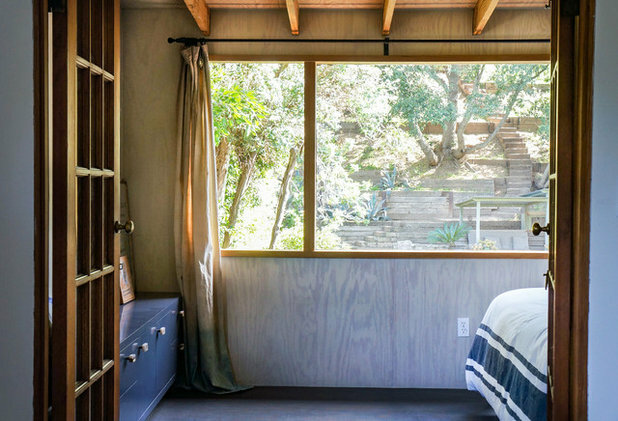 A unique feature of the house is the 150-year-old redwood tree that’s visible from the master bedroom. “The house was built around it — it’s quite magnificent,” Horowitz says. The stairwell is accented with family keepsakes. The polar bear painting was given to the family by von Studnitz’s mother and was done by a Norwegian artist. The wooden console was purchased by Horowitz’s parents in England 52 years ago while they were on their honeymoon. 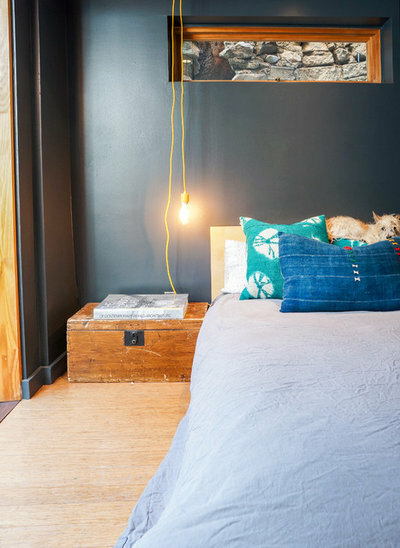 The couple flip-flopped the master suite’s original layout and turned what was the closet into the bedroom. They then reconfigured the “bedroom area” as the closet. 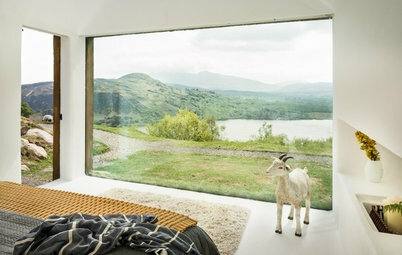 The layout swap allowed them to take advantage of the view into the backyard. The family’s dogs, Marvin, left, and Rosie, also enjoy the view. 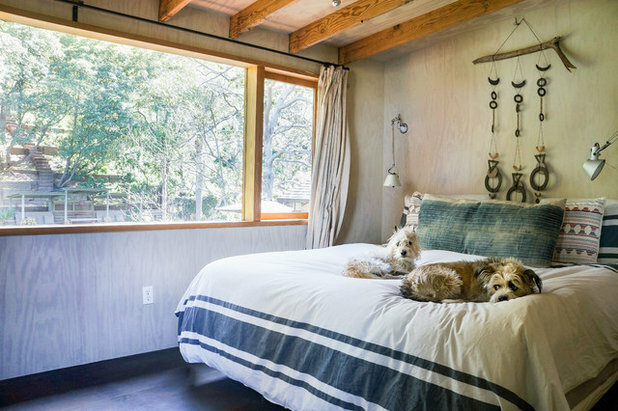 Horowitz notes that what is now their bedroom nook had a great “nest-like” quality they couldn’t pass up. 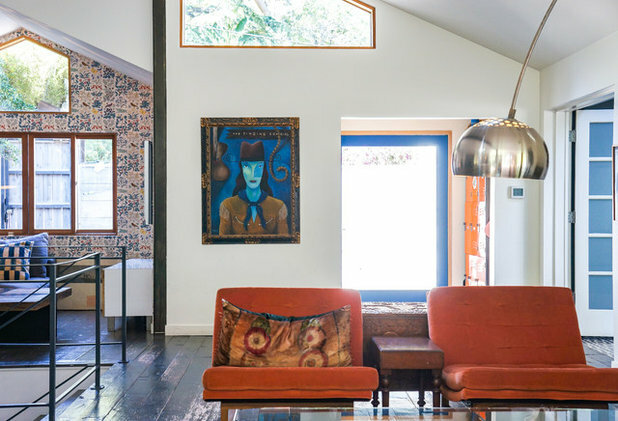 Von Studnitz built the blue console and added handles from Anthropologie. The great redwood coming up through the center of the home can also be viewed from the deck and outdoor living area. 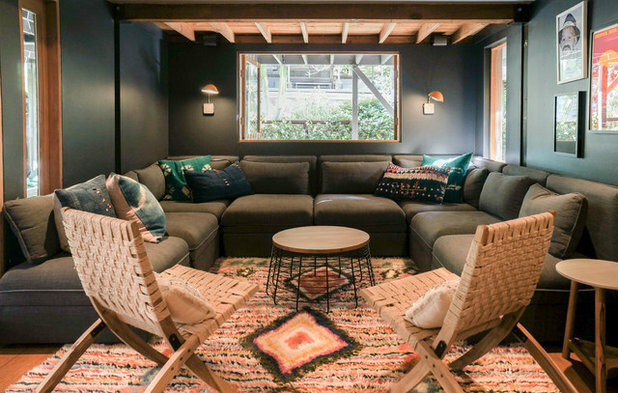 Downstairs is a media room where family movie nights take place. The oversize sleeper sofa unfolds to become a large bed. 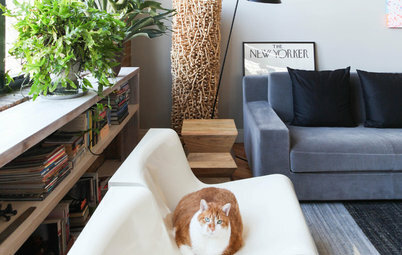 Von Studnitz says it’s the perfect piece of furniture for everything from kids’ sleepovers to hosting his relatives when they visit from Europe. 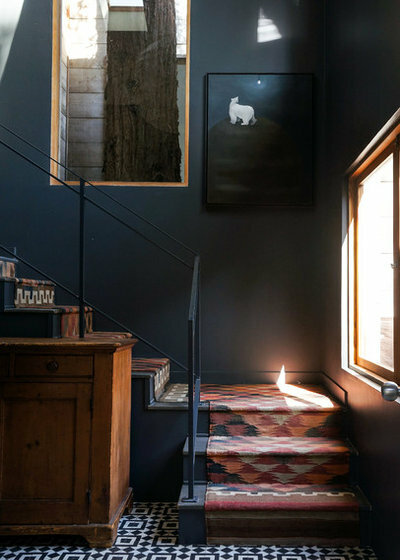 The paint color used in the stairwell, Benjamin Moore’s Raccoon Fur, was also used in the media room to create a dark space conducive to movie watching. The gallery wall features works by Nathaniel Russell, Anthony Burrill, Deedee Cheriel and Kris Chau. 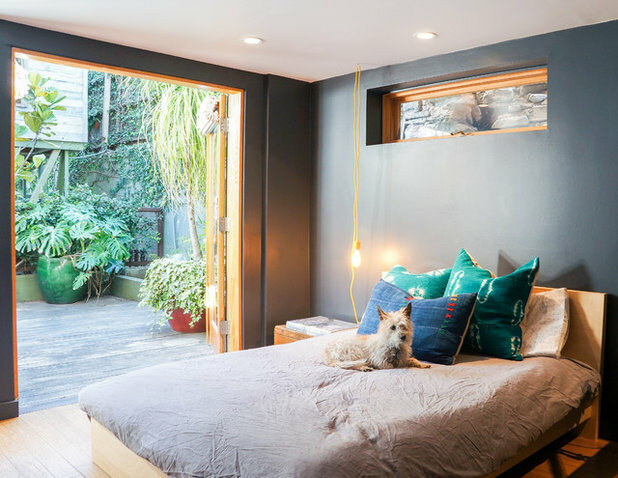 The wall color continues into Jasper’s downstairs bedroom, which opens out onto the home’s meandering backyard. The chest next to the bed is an antique that belonged to Horowitz’s mom. 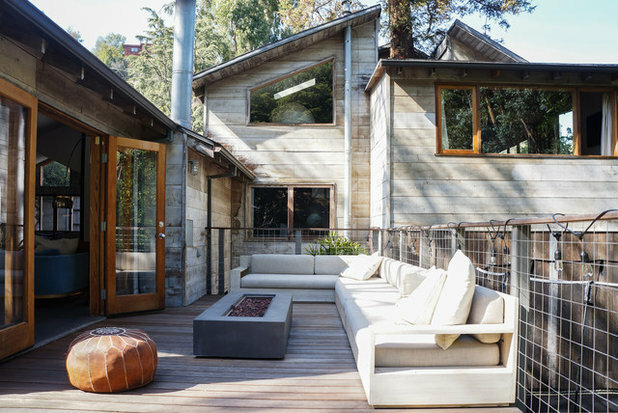 The home’s exterior is clad in cedar, giving it a rustic feel that reflects the Laurel Canyon locale. 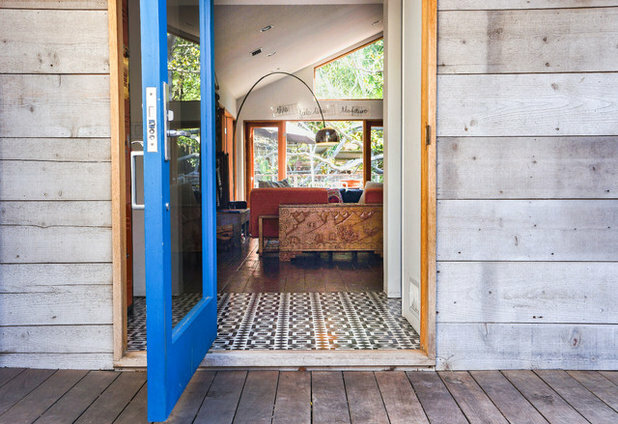 The front door is painted a striking blue from Sydney Harbour Paint Co. 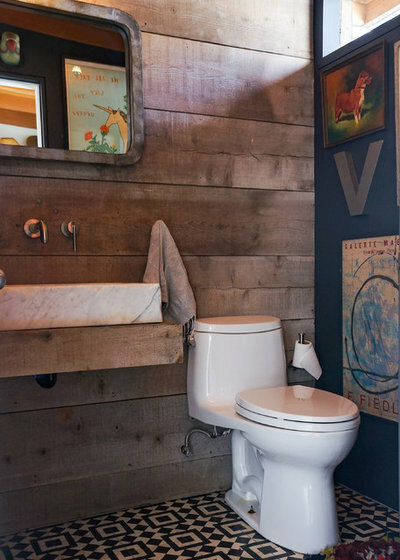 Von Studnitz notes that the siding in the powder room is actually the home’s original exterior. 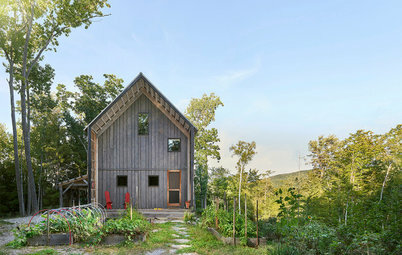 Once they enclosed the space, they reapplied the siding, deciding it would be a fun feature. The pool is often home to swim parties and Nerf gun wars. 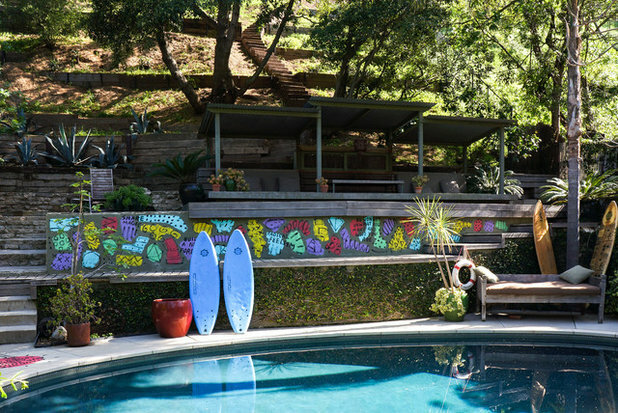 The colorful custom mural above the pool was painted by illustrator and author Dallas Clayton after Horowitz won an Instagram contest. “He asked his followers to send him an email about why he should come and paint their house. I wrote in and forgot about it. Our doorbell rang on a Sunday afternoon and it was him! Fun surprise!” she says. The couple have slowly updated the backyard over the years. “Our original garden design was by Judy Kameon of Elysian Landscapes. Judy’s a dear old friend from high school,” Horowitz says. The space includes a treehouse, seen on the left, that von Studnitz built for the boys. 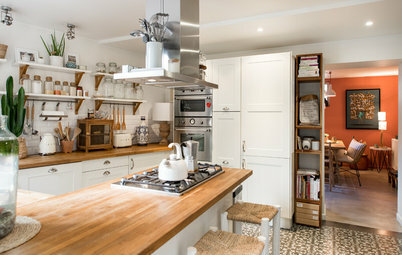 Its style is in keeping with that of the family home and is connected to the main deck by a bridge. “It’s a very special place with a special energy that I don’t think we will ever be able to duplicate anywhere else,” Horowitz says. 6 Likes 7 January 2019 at 1:29p.m. This home is one of my favorites. 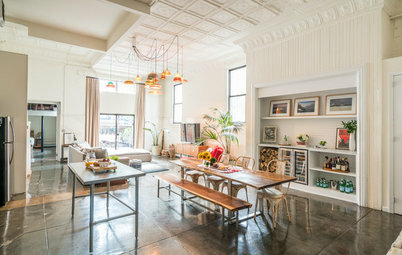 So much character and charm, not like most of the homes on Houzz that look like hotels. No color and no character. 4 Likes 30 January 2019 at 3:27p.m. I never thought "Boho style" would be this beautiful. Like 23 February 2019 at 9:11p.m.